Lavene Candace Avery was born on 27 March 1848 at West Stafford, CT. She was the daughter of Lyman Wolcott Avery and Wealthy Elizabeth Bumsted. Otis Jewett Avery was born on 22 October 1852 at West Stafford, CT. He was the son of Lyman Wolcott Avery and Wealthy Elizabeth Bumsted. Polly Verona Avery was born on 25 July 1854 at West Stafford, CT. She was the daughter of Lyman Wolcott Avery and Wealthy Elizabeth Bumsted. Henry Benton Avery was born on 2 July 1856 at West Stafford, CT. He was the son of Lyman Wolcott Avery and Wealthy Elizabeth Bumsted. Henry Benton Avery married Bessie Sarah Lemon on 1 January 1881 at Exeter, NH. The information on Samuel Benton (Samuel, Samuel, Andrew,John) and his descendants, including Henry Avery, was provided via email from Karen Costantini (karenc@mail2.nai.net). She cites as a source for Henry Avery The Groton Avery Clan Vol. II, by Elroy McKendree Avery and Catharine Hitchcock (Tilden) Avery, Cleveland, 1912, page 839; and an unpublished manuscript The Avery Family, by doug Schenk, 1994. Henry was for some time prior to 1905 a dealer in antique furniture and bric-a-brac at Springfield, MA; he is a farmer. Bessie Sarah Lemon was born on 2 March 1863 at Brookfield, MA. She married Henry Benton Avery, son of Lyman Wolcott Avery and Wealthy Elizabeth Bumsted, on 1 January 1881 at Exeter, NH. Bessie was the daughter of James Green and Nancy Rosina (Upham) Adams, an dlegally adopted daughter of Sewell S. Lemon. Queenie Lemon Avery was born on 15 February 1882 at Barre, Worcester Co., MA. She was the daughter of Henry Benton Avery and Bessie Sarah Lemon. Eugene Leonard Avery was born on 13 April 1883 at Barre, Worcester Co., MA. He was the son of Henry Benton Avery and Bessie Sarah Lemon. Bessie Rosina Avery was born on 21 February 1885 at Worcester, Worcester Co., MA. She was the daughter of Henry Benton Avery and Bessie Sarah Lemon. Richard Henry Avery was born on 16 October 1886 at Barre, Worcester Co., MA. He was the son of Henry Benton Avery and Bessie Sarah Lemon. Orrin Jewett Avery was born on 10 December 1888 at North Attleboro, MA. He was the son of Henry Benton Avery and Bessie Sarah Lemon. Gladys Beatrice Avery was born on 8 November 1890 at North Attleboro, MA. She was the daughter of Henry Benton Avery and Bessie Sarah Lemon. Winthrop Douglass Avery was born on 21 August 1892 at North Attleboro, MA. He was the son of Henry Benton Avery and Bessie Sarah Lemon. Arthur Pomeroy Avery was born on 12 May 1894 at North Attleboro, MA. He was the son of Henry Benton Avery and Bessie Sarah Lemon. Winslow Brewster Standish Avery was born on 10 May 1900 at Springfield, Hampden Co., MA. He was the son of Henry Benton Avery and Bessie Sarah Lemon. Ruth Evangeline Avery was born on 28 June 1903 at Springfield, Hampden Co., MA. She was the daughter of Henry Benton Avery and Bessie Sarah Lemon. Mildred Enneking was born at San Diego, CA. Donna Siemiatkoski cites an obituary in the Hartford Courant, and information from Dorothy Wendell Davis Estarellas. She was the daughter of William C. Enneking and Mary Josephine McAuliffe. Mildred Enneking married Cmdr. Frederick Ellsworth Davis, son of Frederic Wendell Davis and Mary Ellen Taintor, on 4 April 1921 at the Christ Church Cathedral, Hartford, Hartford Co., CT. Mildred Enneking died on 3 March 1982. Grace Gertrude Fiegenbaum was born on 17 June 1883 at Washington, DC. She married George Wood Merwin Vinal, son of Washington Irving Vinal and Emily Merwin Wood, on 19 November 1913. Grace Gertrude Fiegenbaum died in February 1973 at age 89. Dr. Francis Ellsworth Vinal was born on 2 September 1915 at Washington, DC. He was the son of George Wood Merwin Vinal and Grace Gertrude Fiegenbaum. Dr. Francis Ellsworth Vinal was graduated in 1936 at AB; Wesleyan University, Middletown, Middlesex Co., CT. He was graduated at PhD; MIT. He died on 10 October 1973 at Hepatitis, Boston, Suffolk Co., MA, at age 58. [S100] Donna Holt Siemiatkoski, Ellsworth, Page 93/Item 217. Sarah Jane Ensign was born on 8 June 1850 at Simsbury, Hartford Co., CT.1,2 She was the daughter of Henry Watts Ensign and Rebecca Jane Curtiss. Sarah Jane Ensign was a member in 1895 at DAR; 7044, Washington, DC. [S354] Martha Eunice Ensign Nelson, Ensign Record, Page 142. Orange Gaylord was born in 1796. He was the son of Lemuel Gaylord and Sylvia Murray. Orange Gaylord married Hannah Althea Holcombe, daughter of Dr. Jonathan Holcombe and Hannah Everest, on 27 December 1820 at Deerfield Twp., Warren Co., OH. Emily Minerva Gaylord was born circa 1827 at OH.3 She was the daughter of Orange Gaylord and Hannah Althea Holcombe. Emily Minerva Gaylord married Gen. Ferdinand Van Derveer. Emily Minerva Gaylord died in December 1920. [S25] Hannah McPherson, Holcombe Genealogy, Page 195.2/Item A-8-3-3-1-5-7-1. [S104] DAR DAR Lineage book, Vol. XIV:Pg. 114/Item 13304. Gen. Ferdinand Van Derveer was born on 27 February 1823 at Middletown, OH. He married Emily Minerva Gaylord, daughter of Orange Gaylord and Hannah Althea Holcombe. 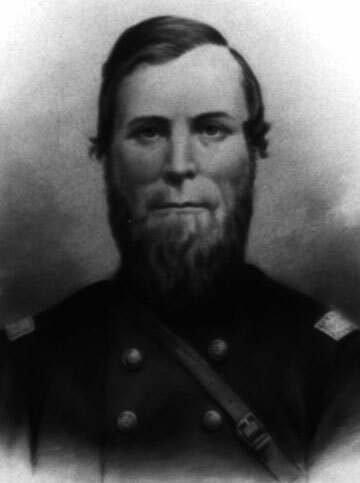 Gen. Ferdinand Van Derveer died on 5 November 1892 at Hamilton, Butler Co., OH, at age 69. Ferdinand was educated at Farmer's college, Ohio, enlisted as a private i an Ohio regiment during the Mexican war, rose to the rank of captain, and headed one of the assaulting columns at the capture of Monterey. He subsequently practiced law, and became sheriff of Butler County, Ohio. At the beginning of the civil was he became colonel of the 34th Ohio volunteers, succeded to the command of Gen. Robert L. McCook's brigade, and led it till the autumn of 1864, when he was made brigadier-general of volunteers, and assigned to the 4th corps. 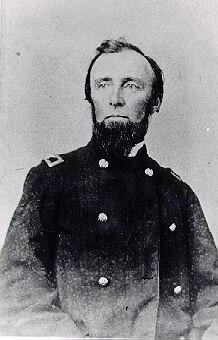 Gen. Van Derveer saw much active service, and among many other engagements, participated in teh battles of Mill Springs, Chickamauga, and Mission ridge. Since 1870 he has been judge of the court of common pleas of Butler county, Ohio. Ferdinand and Emily were enumerated in the 1870 Hamilton, Butler Co., OH, federal census. He was a lawyer, age 47, she was 42. Children in the household were Harri P. 20, Mary 14, Susan 11, and Ichabod 4 months. Also in the household were Hannah Litch 65 and Julia Litch 29. Mary Van Derveer was born in 1855 at OH. She was the daughter of Gen. Ferdinand Van Derveer and Emily Minerva Gaylord. [S25] Hannah McPherson, Holcombe Genealogy, Page 195.2/Item A-8-3-3-1-5-7-1-1. James Phelps Thompson was the son of Henry Thompson and Candace Narcissa Phelps. [S104] DAR DAR Lineage book, Vol. XV:Pg. 176/Item 14471. Clara L. Thompson was a member at DAR; 14471, Washington, DC. She was born at WI. She was the daughter of James Phelps Thompson and Eleanor Anne Work. Phineas served as private in Capt. David Barber's company on duty in New York and was deailed to guard Burgoyne's prisoners. [S104] DAR DAR Lineage book, Vol. XCIII:Pg. 20/Item 92063; Vol. CXXVI/Item 125014. [S52] Henry R. Stiles History of Ancient Windsor II, Vol. II:Pg. 358/Family 63. [S65] Deanna Holcomb Bowman Thomas Holcomb, Vol. II:Pg. 16/Item 22111. [S116] Esther Griswold French and Robert Lewis French, Griswold, Page 117/Item 526. [S377] Coralee Griswold Griswold 6 & 7 Vol 1, page 71. Julia Matilda Holcombe was born on 10 January 1816 at Granby, Hartford Co., CT. She was the daughter of Lemuel Cicero Holcombe and Julia Griswold.4 Julia Matilda Holcombe married Henry Platt Merwin, son of Jesse Merwin and Jane Van Dyke, on 9 April 1837 at home, Granby, Hartford Co., CT. Julia Matilda Holcombe died in 1894. Henry and Julia were enumerated in the 1860 East Granby, Hartford Co., CT, federal census. He was a farmer age 45, she was 44. Children in the household were Julia 15, Harriet 13, Cicero H. 17, Henry 11, Jesse 9, Ara Bella 7, Jennie 3, and Caroline 8 months. Julia's brother Oswald C. was also in the household. Widow Julia and four children were enumerated in the 1870 East Granby, Hartford Co., CT federal census in the household of her father. [S25] Hannah McPherson, Holcombe Genealogy, Page 54.1/Item A-4-5-2-3-1-14-1. [S104] DAR DAR Lineage book, Vol. XVII:Pg. 40/Item 16100;Vol. XCIII:Pg. 20/Item 92063; Vol CXXVI/Item 125014. Henry Platt Merwin was born on 16 July 1814 at Kinderhook, NY. He was the son of Jesse Merwin and Jane Van Dyke. Henry Platt Merwin married Julia Matilda Holcombe, daughter of Lemuel Cicero Holcombe and Julia Griswold, on 9 April 1837 at home, Granby, Hartford Co., CT. Henry Platt Merwin died on 30 March 1866 at age 51. Harriet Matilda Merwin was born on 18 February 1847 at Granby, Hartford Co., CT. She was the daughter of Henry Platt Merwin and Julia Matilda Holcombe. Harriet Matilda Merwin was a member in 1896 at DAR; 16100, Washington, DC. [S104] DAR DAR Lineage book, Vol. XVII:Pg. 40/Item 16100. Julia Griswold Merwin was born on 30 November 1844 at Granby, Hartford Co., CT. She was the daughter of Henry Platt Merwin and Julia Matilda Holcombe. Julia Griswold Merwin married William Ennis in 1874. Julia Griswold Merwin was a member in 1896 at DAR; 16101, Washington, DC. [S104] DAR DAR Lineage book, Vol. XVII:Pg. 41/Item 16101. William Ennis was born in 1841. He married Julia Griswold Merwin, daughter of Henry Platt Merwin and Julia Matilda Holcombe, in 1874. Caroline Maria Merwin was born on 16 August 1859 at Granby, Hartford Co., CT. She was the daughter of Henry Platt Merwin and Julia Matilda Holcombe. Caroline Maria Merwin married William Haven, son of James Henderson Haven and Elizabeth Salter Cushman, on 21 March 1883 at New Haven, New Haven Co., CT. Caroline Maria Merwin was a member in 1896 at Elizabeth Ross Chapter, DAR; 16103, IA. She died on 7 July 1917 at age 57. [S104] DAR DAR Lineage book, Vol. XVII:Pg. 41/Item 16103; Vol. XCIII:Pg. 20/Item 92063; Vol CXXVI/Item 125014. William Haven was born in 1845. He was the son of James Henderson Haven and Elizabeth Salter Cushman. William Haven married Caroline Maria Merwin, daughter of Henry Platt Merwin and Julia Matilda Holcombe, on 21 March 1883 at New Haven, New Haven Co., CT.
From Carol Laun: As a child Richard lived in the Turkey Hills (East Granby) section of Granby, in the big family home on Hartford Avenue. He was educated in local schools, including a private Academy. His life was adventurous and he traveled extensively in his work. For nearly ten years (1845-1855) he worked on the Isthmus of Panama, drawing maps, planning grades, and building bridges for the Panama Railroad. With his brothers, Franklin Porteous and Henry Lyman, he build the bridge across the Savannah River at Savannah, Georgia, using slave labor. His name is the first listed on the Granby Civil War Monument. Richard and Harriet were enumerated in the 1860 East Granby, Hartford Co., CT federal census, page 4. He was a farmer, age 35, Harriet was 32, Clara was 6 and Mary was 1. Thomas Holcombe, age 79 was also in the household. Harriet was enumerated in the 1870 East Granby, Hartford Co., CT federal census, page 3. She was 42, Clara 16, Mary 11, and Richard E., 9. The Confederate Flag that was sent home with his personal effects is now housed at the Salmon Brook Historical Society in Granby, donated by his daughter. [S25] Hannah McPherson, Holcombe Genealogy, Page 52.1/Item A-4-5-2-3-1-8-6.